His name is Tater Tot. 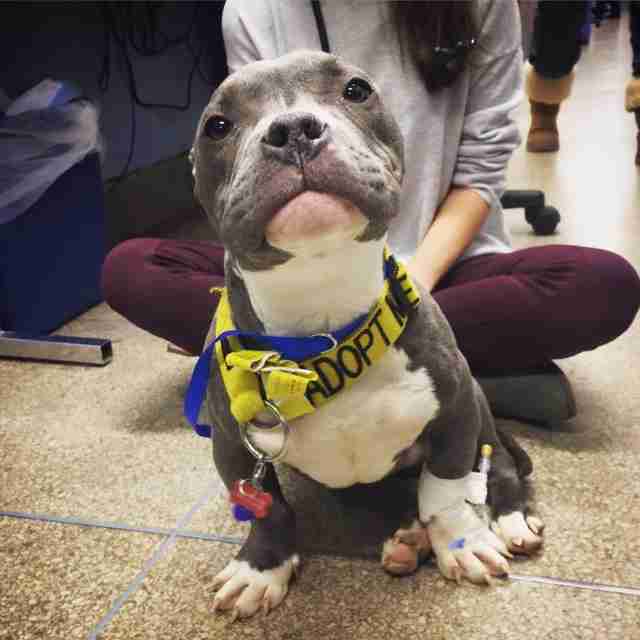 When Elli Frank put her foot in a closing door at the animal shelter in New York City on New Year's Day, she had some explaining to do. "I promise you I'm normal," Frank, co-executive director of Mr. Bones and Co., told the startled staff member. "Can you send someone out here who can talk about a dog?" Frank had seen the dog's picture posted in a Facebook group. 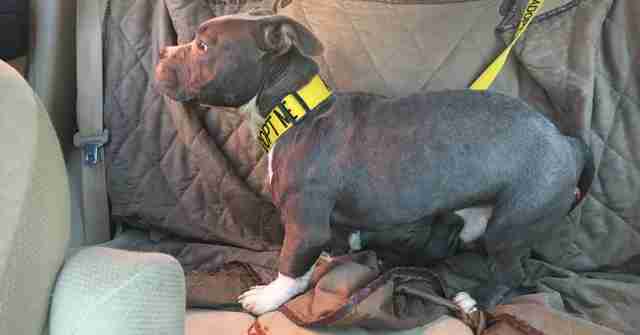 He was injured and faced spending the holiday - when the shelter was closed - in pain. Although Mr. Bones and Co. was at capacity for animals - and although her colleagues said they absolutely could not take any more dogs - she decided to pay a visit. After all, she was in the area anyway, checking on another dog and dropping off donations and, well, OK, so she turned right, when she was supposed to turn left - and ended up at the shelter. "The head admissions counselor happened to be one of the four people working," Frank tells The Dodo. "She was so kind. Her exact words were, 'Come on in out of the cold.'" Of course, Frank had to do a little more explaining. "I'm really sorry to stalk you," she said. "I'm a crazy dog person, in a good way. There's this dog ... "
Ahhh, yes. That dog. The one who was suffering from rectal prolapse. In other words, parts of his insides were hanging out. 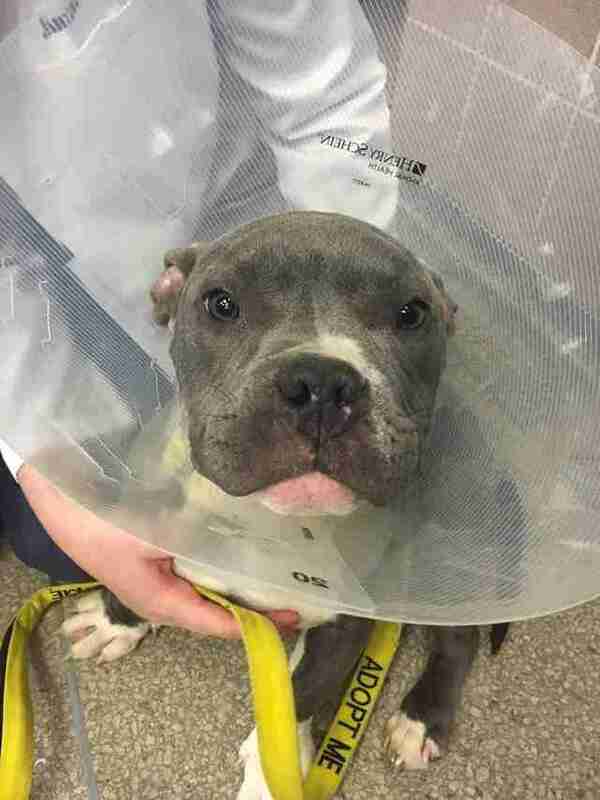 The dog, who's between 10 and 12 months old, was brought into a Harlem shelter run by Animal Care Centers of New York City (ACC) on New Year's Eve. Not long after that, Frank was on the doorstep. She couldn't take the dog home right away, as the shelter had to confirm that Mr. Bones is an aurthorized rescue, so Frank wrote down her phone number and told the admissions counselor, "Listen, I know you think I'm crazy. I've got nothing to do today. Call me." Then she drove back to her home in Brooklyn, sat on the couch for about five minutes ... and the phone rang. Come and get this dog. 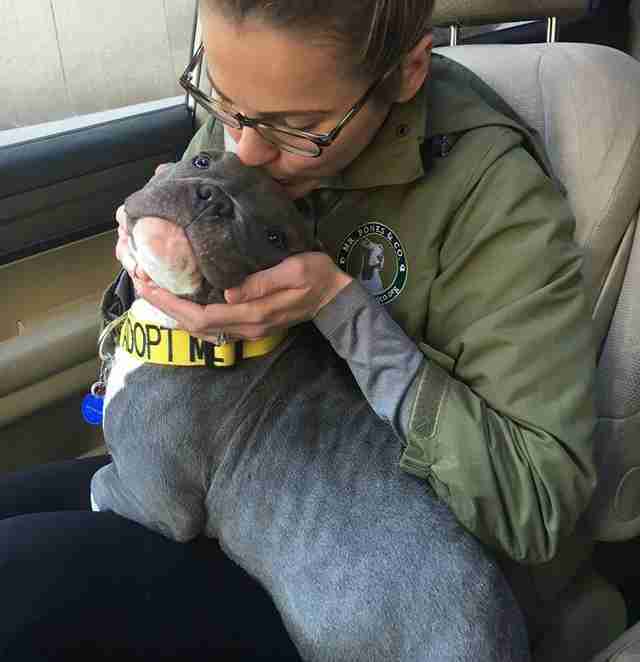 And so she drove back to Harlem to pick up the dog with the strange and painful injury - the dog who would become the organization's first rescue of 2017. "I needed to do this," Frank says. "I think this dog's urgency spoke for itself. I had to carry him like a baby. He couldn't sit down in my car." 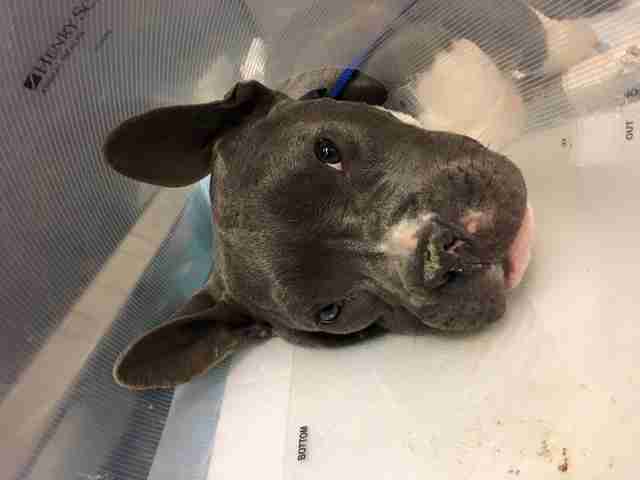 While no one can say exactly how this dog got hurt - "It's wasn't naturally caused," Frank says - it was clear that he would have suffered a lot longer had Frank opted not to make her case at the shelter door. 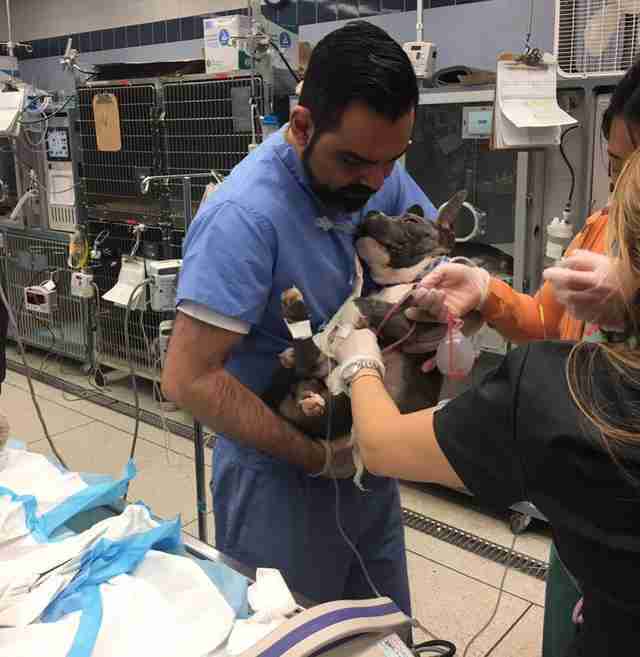 "Despite this dog's severe pain - with two-and-a-half inches of the inside of his body hanging out of him - he was so happy and so resilient. And just ... a tater tot. "So we named him Tater Tot." "You don't fully grasp how small he is," Frank adds. "He looks like a baby hippopotamus." An ultrasound revealed internal damage. He also has orthopedic issues in his front legs. And he may even have some dwarfism. "He is put together as though a child was putting together a puzzle and couldn't get the pieces to fit, but thought the picture looked perfect the way it was," Frank says. "These puzzle pieces were kind of forced together. Even though it looks a little bit wonky, it works. And it's beautiful." The rescue organization's supporters agree, as they pitched in to cover all of Tater Tot's medical expenses. "We've never, ever, ever had the community come together like this for a dog so quickly," Frank says. 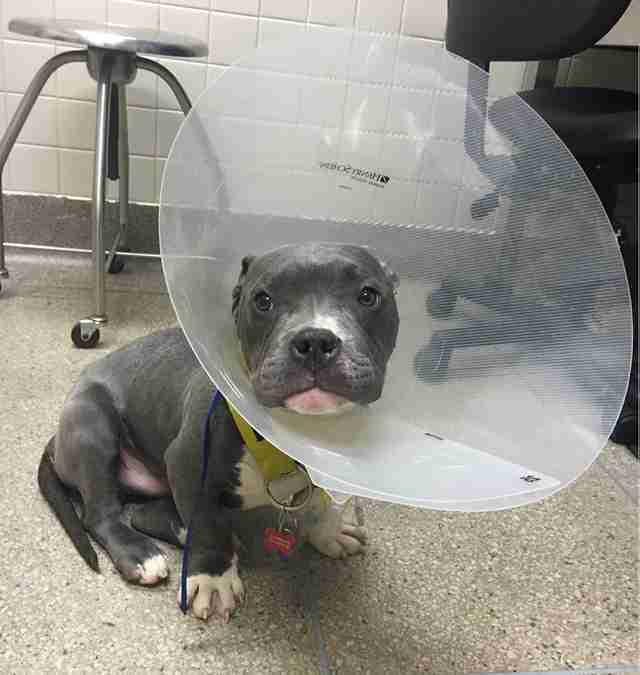 "We're lucky if we raise half of what a dog's medical costs are. "What an incredible way to start 2017." Frank will be fostering Tater Tot, while monitoring his condition and, well, continuing to fall deeper in love with the jigsaw puzzle of a dog. "He's got the body of an English bulldog, a head the size of a pit bull, with the same features of a pit bull, and the eyes of a French bulldog," she says. "He's something magical." And before long, he will be looking for the final piece to his puzzle - a forever home. "This is just the beginning with this guy," Frank says. 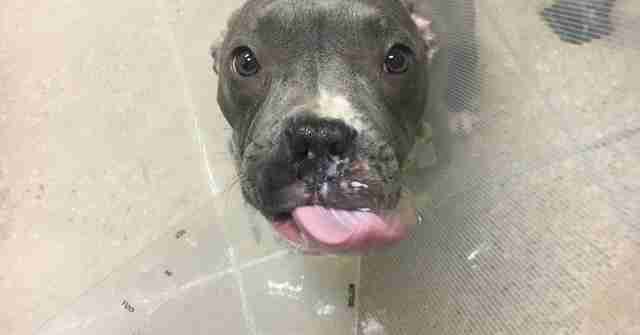 You can follow Tater Tot's journey to a full recovery on the group's Facebook page. And if you would like to support Mr. Bones and its mission to save countless animals like Tater Tot, consider making a donation here.